Extend Your Lashes lengthens and thickens eyelashes with single strands of synthetic eyelashes that are curved to replicate a natural eyelash. They are applied to individual eyelashes, one lash at a time, for a natural, elegant and luscious look. Extend Your Lashes is perfect for special occasions as well as for every day wear. Extend Your Lashes look and feel completely real and natural. How long do Extend Your Lashes Last? Semi-permanent Extend Your Lashes can last up to 2 months, depending on the natural growth cycle of your eyelashes. You will probably want touch-ups every three to four weeks. Extend Your Lashes adhesives are specially formulated with a unique waterproof bonding agent to last. Other glues may not last as long because of an inferior bonding strength. Can I swim, shower, exercise, or visit a spa while wearing Lashes ? Yes. Our specially formulated bonding agent allows you to shower, swim, exercise, sleep and spa worry-free while wearing Lashes . You can enjoy these lashes with little need to adjust your lifestyle. Please do not swim or spa for 48 hours after the procedure to allow the bonding agent to fully cure. Can I apply Extend Your Lashes to my own eyelashes? No. Only a trained professional will be able to safely apply Eyelash extensions. Unprofessional application or self-application may cause eye injury, clumpy, unnatural looking lashes, or damage to your own lashes. 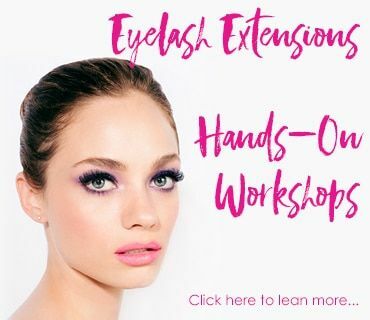 Extend Your Lashes specialists are trained and certified to apply one lash at a time to your individual natural eyelashes to achieve long, thick, luscious, and natural looking eyelashes. Can I apply mascara to Lashes ? One of the main advantages of Extend Your Lashes is never needing mascara again. However, if you must have the mascara look, only water based mascara can be used. DO NOT USE OIL-BASED OR WATER-PROOF MASCARA. Waterproof mascara along with any type of oil based mascara will dissolve the bonding agent and cause the lashes to fall off. You will be comfortably reclined with your eyes closed while extensions are applied individually to your natural eyelashes. Depending on the experience of the professional applying Lashes , it generally takes between 90 to 150 minutes to apply one set of lashes . The procedure is so relaxing and comfortable that many clients fall asleep. How much does it cost for an application of Lashes ? Depending on your location and the amount of eyelash extensions needed, professionals are currently charging between $250 and $600 for a full set. Hollywood has long since enjoyed extending their beauty with Eyelash Extensions. Models and actors have been using eyelash extensions for years. Now, you can have them too. Because they look so real, anyone could be wearing them and you would never know! Be the first in your area to wear Eyelash Extensions. Currently the FDA is not regulating eyelash extensions because the eyelash extensions are applied to the natural eyelash hairs and do not touch the skin. The primary ingredient in our Extend On glue is the same ingredient used by plastic surgeons in the U.S. for suture-less wound closure. The application process is pain-free and relaxing. In fact, many clients fall asleep during the procedure. However, improper application by an unqualified technician can cause damage to your eyes and lashes. Do not trust your eyes to just anyone.